Steel Hand Trucks are used for Applications including Commercial, Industrial, Distribution, and more. 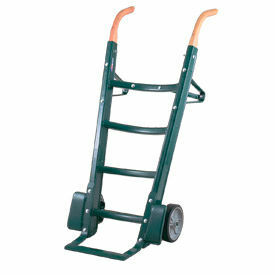 Steel Hand Trucks are made of steel for long lasting durability and dependability. Trucks allow ergonomic content mobility and transport. Includes wheels and push handle for convenient maneuverability and handling. Available types include Ace-Tuf, Flat Free, Pneumatic, Semi-Pneumatic, Solid Rubber, and Versa-Tech. Weight capacities range from 300 to 1000 lbs. Dimensions vary per model. Valley Craft® EZY-Tilt™ Mini-Pallet Fork Hand Trucks provide Easy Transport of Mini-Pallets, Large Containers, Large Bags and more. 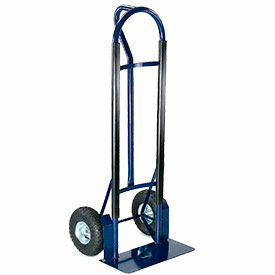 Valley Craft® EZY-Tilt™ Mini-Pallet Fork Hand Trucks offer 1,000 lb. capacity and are equipped with a double-forked steel shoe that automatically locks into position and is released by simply tripping a foot lever. 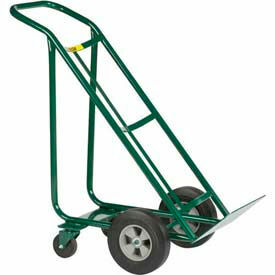 Steel Hand Trucks are made of 14-gauge, 1-1/8" tubular steel with solid welds and form-fitted joints. Reinforcements at stress points. 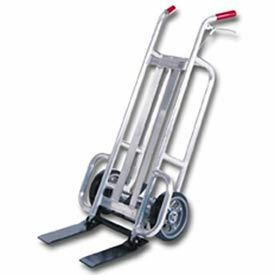 Aluminum Hand Trucks are made of 1-5/16" spark-resistant tubular aluminum. For use around corrosive materials and for services requiring truck transport. Optional Plastic Mini-Pallets are designed especially for EZY-Tilt™ Pallet Fork Hand Trucks. Plastic Pallet has a stringer height of 1-½" to meet various handling needs. Pallets are black in color and easily handle up to 800 lbs. Little Giant® Reinforced Nose Steel Handle Trucks provide Transportation to Large and Heavy Items in Warehouse, Stockroom and Shipping Department Environments. Little Giant® Reinforced Nose Steel Handle Trucks are made of steel for long lasting durability. 12"D x 14"W reinforced nose plate allows handing bulky loads. 4 curved ribs with vertical center strap provide added stability for cargo. Zinc-plated D-shaped axle eliminates turning and wear of axle. Axle is interchangeable in tri-hole axle bracket. Wheel types are Flat Free, Pneumatic and Solid Rubber. Available handle types are Continuous Handle, Continuous Handle with Foot Kick, Double Handle, Double Handle with Foot Kick, Loop Handle and Loop Handle with Foot Kick. Wheel diameters are 8" and 10". Weight capacity is 800 lbs. Shovel Nose Steel Hand Trucks provide Transportation for Large Heavy Items in Warehouses, Shipping Departments, Residential, Commercial and Industrial Environments. 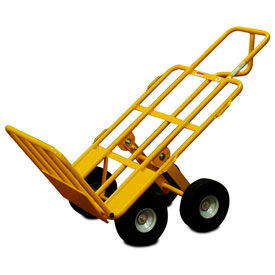 Shovel Nose Steel Hand Trucks are made of steel for long lasting durability. Beveled leading edge provides easy maneuverability under large loads. Curved ribs and vertical center brace provide added stability. Wheel guards provide added safety. Handle types are Continuous Handle, Continuous Handle with Foot Kick, Double Handle, Double Handle with Foot Kick, Loop Handle and Loop Handle with Foot Kick. Wheel types are Flat Free, Mold-On Rubber, Pneumatic, Polyolefin, Solid Rubber and Steel. Wheel Diameters are 8" and 10". Weight capacities are 800, 1000 and 1500 lbs. 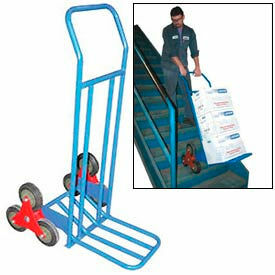 Vestil Steel Stair Climbing Hand Trucks are used for Moving Up and Down Stairs with Heavy Loads. Vestil Steel Stair Climbing Hand Trucks are made of steel for long lasting durability and dependability. 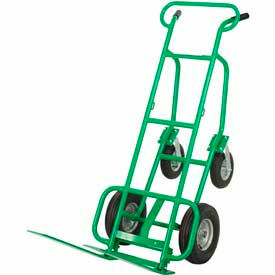 Stair Hand Truck provides two people access for transporting loads up and down stairways or hills. Easy grip handles allow comfort. Heavy duty wheels provide mobility. Types are Steel Stair Climbing Hand Truck and Steel Stair Hand Truck with Four Handles. Color finishes are Blue and Yellow. Capacities are 300 lbs. and 500 lbs.. Overall dimensions and wheel types/sizes vary per type. Valley Craft® Multi-Use Cart Frames & Forks allow Safe and Efficient Transfer of Heavy Engines, Transmission Cases and Cumbersome Part's Bins. Valley Craft® Multi-Use Cart Frames and Forks are for use in distribution centers, semi-trucks and garages. Made with heavy duty 1-1/4" thick x 12-gauge wall tube frame. Handles up to 800 lbs. Available with choice of Never Flat Pneumatic tires or Mold-On Rubber tires. Note: Flat Forks or Transmission Forks are Sold Separately. Valley Craft® Deep Frame Bag and Box Hand Trucks provide Ergonomic Content Transport for applications including Commercial, Industrial, Distribution, and more. Valley Craft® Deep Frame Bag and Box Hand Trucks are made of aluminum or steel for durability. Trucks support load weight and reduce operator fatigue for warehouses, trailers, and more. Wheels and swivel casters allow convenient unit mobility and maneuverability. Aluminum Frame Model ensures spark-resistance for safety. Steel Frame Model features form-fitted joints for added stability. Types are Solid Rubber and Solid Rubber with Brake. Weight capacity is 1000 lbs. Dimensions vary per model. Wooden Handle Hand Trucks are used for Applications including Commercial, Industrial, Distribution, and more. Wooden Handle Hand Trucks are made of high quality materials for long lasting durability and dependability. Trucks allow ergonomic heavy duty content mobility and transport. Slant back design provides convenient load break-over. Curved frame cross-members accommodate cylindrical objects. Integral steel wheel guards provide load protection. Features high-capacity mold-on rubber casters for convenient maneuverability. Type is Mold-On Rubber. Weight capacities range from 600 to 1000 lbs. Dimensions vary per model. 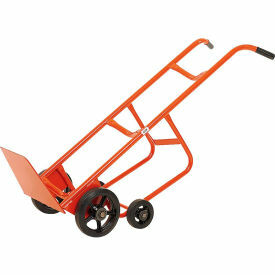 Little Giant® Tilt Back Hand Trucks are used for Transporting Heavy Loads. Little Giant® Tilt Back Hand Trucks have a steel construction for long lasting durability and strength. Hands free operation allows the user to open doors without having to lower the load like with typical hand trucks. Length is 36 in., width is 21 in. and height is 42 in. Capacity is 800 lbs. Choose from models with Pneumatic or Solid Rubber wheels for increased versatility. 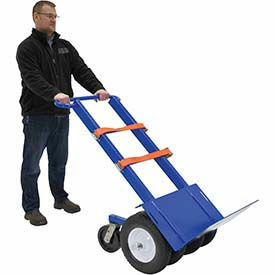 Vestil Arctic Grip Hand Truck features an Insulated Handle for added comfort in Cold Working Environments. Vestil Arctic Grip Hand Truck features a Line-X® polyurethane/polyurea coated handle that protects the operators hands during use and offers superior grip. 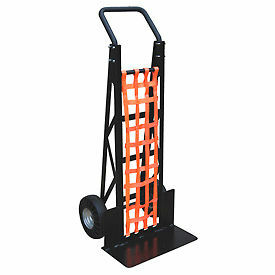 Hand Truck includes a nylon net to help retain smaller boxes and packages during transport. Rolls smoothly with solid rubber, shock absorbing, flat-free 10" wheels. Large 19"W x 8-½" noseplate accommodates oversized cargo, and integral wheel guards offer added cargo protection. All-welded steel construction has a durable black powder coat finish for long life. 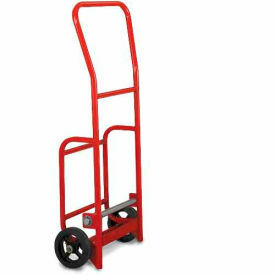 Valley Craft® Casino Hand Truck is used for Safe and Efficient Handling of Heavy Industrial or Commercial Material Loads. 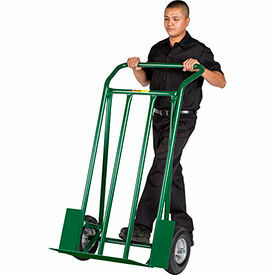 Valley Craft® Casino Hand Truck is made of solid steel construction for long lasting durability and dependability. 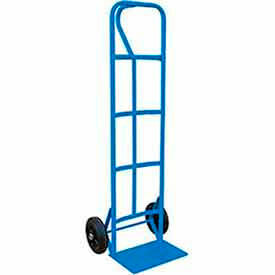 Heavy duty Hand Truck provides safe and efficient way to move heavy loads on steps and inclines. Sliding frame helps the operator break over the heavy loads more easily by allowing the frame-and-shoe assembly to slide downward as the truck is lifted back. Ratchet securely tightens and locks the strap to secure the load and rear swivel wheels help prevent loads from tipping back and provides ease of movement. Secure strapping attachment prevents twisting and allows rapid rewinding. Unit adjusts vertically on a mounting bar. Quick release lever unlocks strap. Heavy duty 12 inch diameter pneumatic tires. Hand lever operates brake bands to both load-carrying wheels. 15 foot nylon strap included. 1000 lb. load capacity. Gray finish. Measures 50 in. L x 23 in. W x 332 in. H.
Valley Craft® HVAC Hand Trucks are used for Safe and Efficient Material Handling of Heavy, Bulky Heating and Cooling Units. Valley Craft® HVAC Hand Trucks are solidly made of 1-1/8 inch heavy wall steel tube frames for long lasting durability and dependability. Ergonomic Hand Trucks feature a 4-wheel design with a loop handle for efficient transport of oversized loads. 24 inch fork allows for safe loading and unloading of large heating and air conditioning units or any other large palletized load. Over-sized fenders stabilize the load. Foot-activated trip pedal locks and unlocks fork position. Forks lock against the frame for compact storage. Roll easily on pneumatic tires. 600 lb. 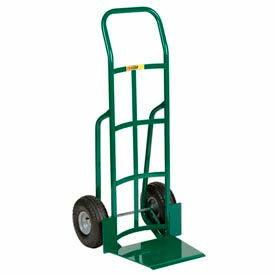 load capacity hand trucks are available in Blue, Green or Red color powder coat finishes. 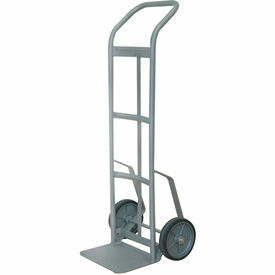 Wesco® Stainless Steel Hand Truck is perfect for Corrosion-Resistant, Food Service and Clean Room Applications. Wesco® Stainless Steel Hand Truck is constructed using premium 304 stainless steel to provide long-lasting durability in corrosive environments. Stainless Steel Hand Truck features a curved frame that also holds 5 gallon pails and kegs. Noseplate is 14"W x 7.8"D. Rolls smoothly on 8" mold-on rubber wheels with polyolefin center hubs. Little Giant® Super-Sized Hand Truck provides Transportation to Oversized Items in Commercial, Industrial, Warehouse and Residential Environments. 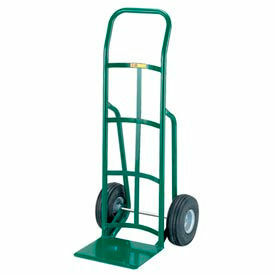 Little Giant® Super-Sized Hand Trucks are made of all-welded steel for long lasting durability. Extra large 1/4" thick steel nose plate measures 24"W x 12"D. Oversized frame is 55" high and constructed of 1-5/16" diameter 12 gauge steel tubing to provide extra strength. Pneumatic wheels are 12" x 3-1/2" allowing easy mobility of oversized items. Color finish is Green. 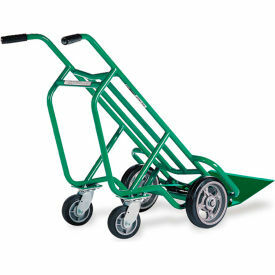 Canway Steel Hand Trucks are built with a versatile continuous-style handle. Welded steel frame features 1", 14-gauge tubing. Basket style back. 14" x 8" Toe plate. 8" Solid rubber wheels with polyolefin hub. Load capacity is 600 lbs. Durable blue powder coat finish. 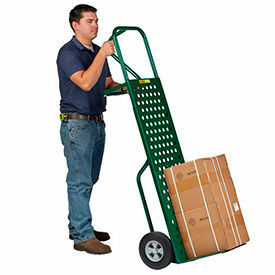 Little Giant® Perforated Deck Hand Trucks are ideal for Loading and Transporting Boxes. Little Giant® Perforated Deck Hand Trucks has a perforated 48" high deck for loading and transporting items when in a horizontal position. The 64" overall height supports large oversized loads. The large 13-1/2" deep x 1/4" thick nose plate measures 16" wide at the back with a tapered front edge for an easy glide under the load. The 1.05" diameter 14 gauge steel tubing frame is fully welded for strength and rigidity. Wheel guards protect the load from the wheels. Wheel types are Solid Rubber, Pneumatic, and Flat-Free. Wheel diameter is 10". Weight capacity is 800 lbs. Vestil Off-Road Hand Truck allows easy Material Transport over a Rough Terrain. The Vestil Off-Road Hand Truck's extended handle helps the user maintain an ergonomically friendly posture. The strong steel construction and powder coat finish provides durability, while still maintaining its lightweight functionally. Four 16" x 4" foam-filled wheels are directly behind the base, and two 8" x 2" phenolic additional casters are utilized when in motion to provide superb stability throughout its use. Twin positive ratchet assemblies, with 2" x 36" nylon straps, help secure the cargo during transit. 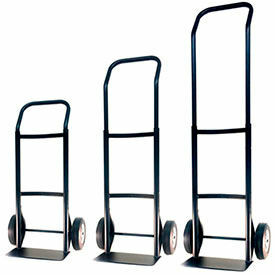 Harper™ Expandable Continuous Handle Hand Truck Easily Converts to Three Handle Height Positions. This hand truck converts with no pins or clips. 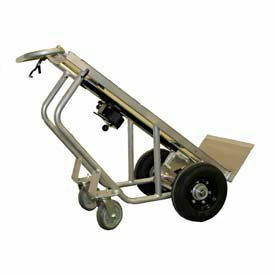 Expandable - 3 Hand Trucks in 1 easily adjusts handle height by pushing the spring button latch. Small height position of 40" for small loads and compact transportation and storage. 49" high handle position for normal use. 58" high handle for tall loads. Continuous Flow Back Handle provides easy load control. Curved back frame is ideal for round loads. 8" Solid Rubber Wheels provide easy mobility. 14" x 7-1/2" Base Plate. Snap-Loc™ Hand Trucks are used for applications including Shipping, Manufacturing, Commercial, and more. Snap-Loc™ Hand Trucks are made of steel for long lasting durability and dependability. 4 wheel stability enhances work efficiency and operator safety over standard hand trucks. Integrated strap anchors provide content security and fall protection. Oversized tires provide load balance stability and support. Extendable tire stability bar folds for easy storage. Weight capacities are 750 and 1000 lbs. Color finish is Yellow. Dimensions vary per model.